Jesuit and Companion school students joined many of their peers across Australia taking part in Refugee Week events last month, says Jesuit Refugee Service. In Refugee Week (17 – 23 June), schools across Australia answered the call to action and advocated for the rights of people seeking asylum, calling on the government not to slash life-saving Status Resolution Support Services (SRSS) for the most vulnerable people in our communities. The students, staff, families and others involved in the schools’ communities joined together to support refugees and people seeking asylum, coming up with creative ways to speak out against the punitive measures being enforced by the federal government and finding practical ways to support those who came to Australia simply to find safety. Schools showed their support by campaigning for the rights of refugees and asylum seekers on social media. John XXIII College in Perth spread the word about the Australian government’s intention to slash SRSS funding to people seeking asylum, cutting them off from access to income support, torture and trauma counselling, and casework services. The video shows students standing in solidarity with children, women and men seeking safety across Australia and fighting for their basic human rights and their dignity. In Adelaide, St. Ignatius College hosted the 14th annual Friendship Cup game, celebrating the event on Facebook to raise awareness about the dire circumstances people seeking asylum will find themselves in when cuts to SRSS are made. ‘Please keep in mind the millions of displaced people in the world this week and ask yourselves when history looks back, will it be to see them standing alone or will it see we were standing with refugees?’, asked Celeste, the school’s Social Justice Captain. Other schools found ways to support JRS and the people we serve by collecting goods for their Foodbank program. The program provides much needed fresh food and groceries to over 250 individuals and families every month. For the fifth year in a row, Loreto Kirribilli ran a drive during Refugee Week, collecting over 40 boxes of staples including donations of non-perishable food items, toiletries and other groceries from the school community. Our Lady of Lourdes Primary School in Seven Hills, NSW also launched a drive, collecting several boxes of items to be donated to Foodbank as well as inviting JRS, along with a speaker who has lived refugee experience, to address the school community and raise awareness of the plight of people seeking asylum. Students at Xavier Catholic College Hervey Bay. Loyola Senior High School in Mount Druitt, NSW ran a fundraising rice day on International Refugee Day (20th June) to raise awareness of people seeking asylum as well as funds for JRS Australia. JRS School Engagement Coordinator, Anne Nesbitt, was invited to attend a Mass to celebrate refugees and to receive a cheque for the funds JRS urgently needs to continue providing on the ground support for people seeking asylum. St. Oliver’s Primary School in Harris Park, NSW used Multicultural Day to celebrate diversity in the school community. The students were encouraged to wear their cultural costume and they, along with several parents and staff, participated in a Table Talk facilitated by Sydney Alliance. JRS organised a speaker, Simon, with lived refugee experience to tell his story of fleeing war in Syria and to explain what life was like when he arrived in Sydney. After Simon finished telling his story, the students spent time discussing ways the school community could welcome those new to Australia. 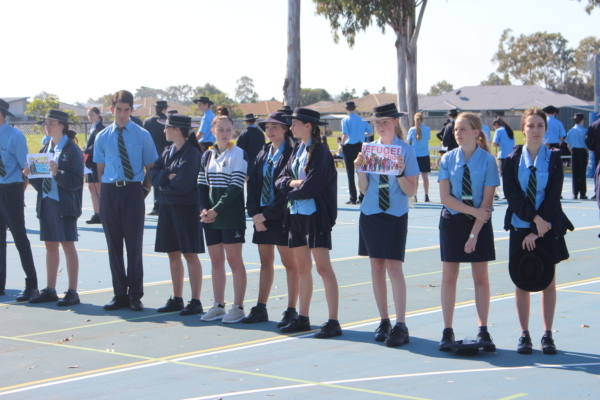 Meanwhile, in Hervey Bay, Queensland, Xavier Catholic College held a Circle of Silence during recess. Students and some staff stood in solidarity for over 30 minutes, bringing light to the fact that often, people fleeing their homes in search of safety are not given a voice in our communities. Our Lady of Mercy College in Parramatta, NSW invited JRS’ School Engagement Coordinator, Anne Nesbitt, to speak about the global context of people seeking asylum during a Social Justice lunchtime meeting. Stella Maris College in Manly, NSW invited different agencies assisting people seeking asylum to the College to speak to students and staff as part of Stella Day. JRS’ Casework Team Leader, Sr Sarah Puls, spoke at the General School Assembly about her vocation to the sisterhood and held tutor groups with JRS’ School Engagement Coordinator, Anne Nesbitt, about the work of JRS and the people we accompany, advocate for and serve. The CEDP (Catholic Education Diocese of Parramatta) held a Staff Renewal week during Refugee Week with approximately 380 CEDP non-teaching staff members attending one of the days. The aim of the week was to grow in the mission and understanding of the Church as regards refugees and people seeking asylum, to understand the struggles and issues they face, so staff can better respond to a call to action. The program aligned with Bishop Vincent Long’s Diocesan Journey: Walking with Refugees and People Seeking Protection. JRS was invited to speak about the global context of people seeking asylum and about the current situation in Australia. Each day, a speaker with lived experience told about his journey fleeing violence and how he came to resettle in Australia. As a result of the day, over 63 staff members expressed an interest in volunteering for JRS. JRS expressed thanks to all schools and school communities involved in raising awareness and funds for the plight of refugees and people seeking asylum in Refugee Week. Find out how you can support JRS here.